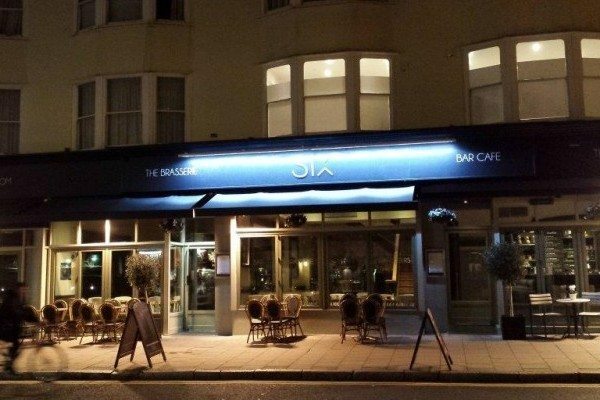 Six is an exciting, brand spanking new restaurant on Western Road near the Hove/Brighton border. You may have been there in one of its former guises as Barneys or Richards or latterly the Good Food Club. Many restaurants have been and gone here but this reviewer for one hopes that Six will be with us for many years to come. 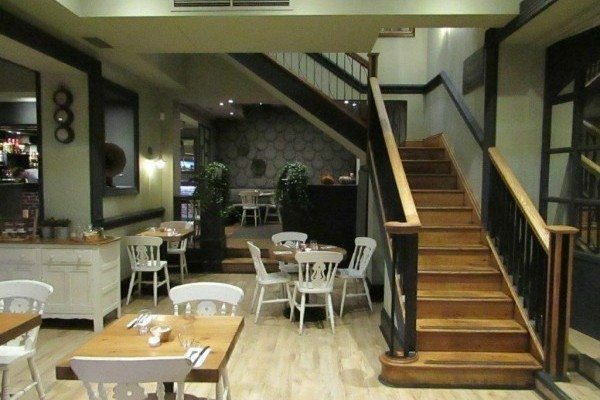 This large restaurant has been utterly transformed and now boasts three distinct areas. 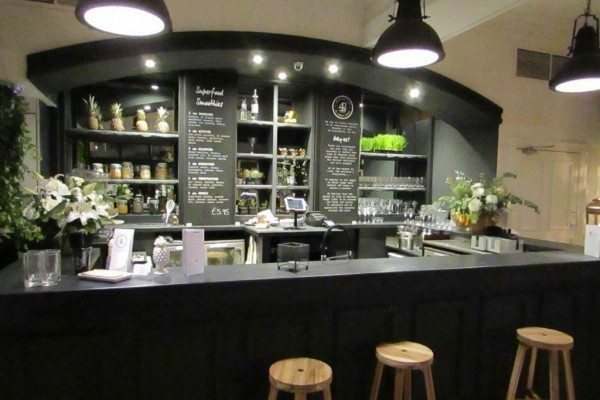 You have the swish, moodily-lit dining room, which is intimate and romantic, the brasserie bar, which is more laid-back and informal and the bright and cheerful organic cold-pressed juice and cocktail bar brought to you by 42Juice. 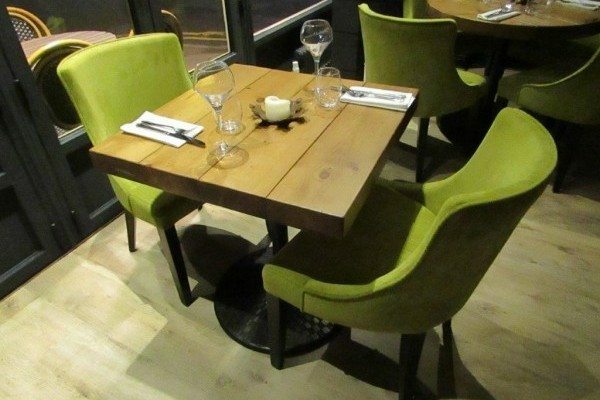 There is also plenty of outdoor seating for those warm summer months. 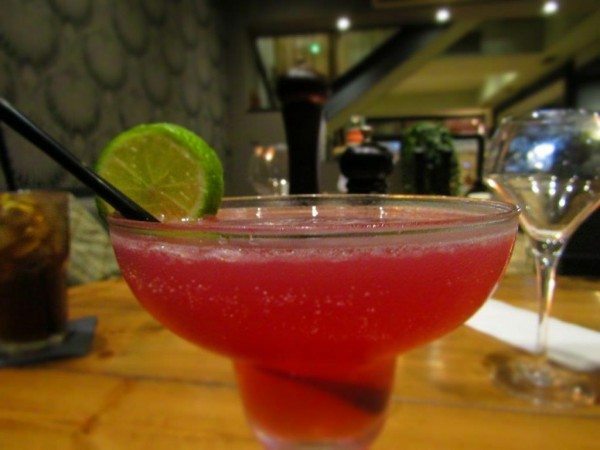 It is very convenient to get to with a bus stop directly opposite and a taxi rank at the end of the block, and it’s a great place to start, finish or even while away an entire evening. 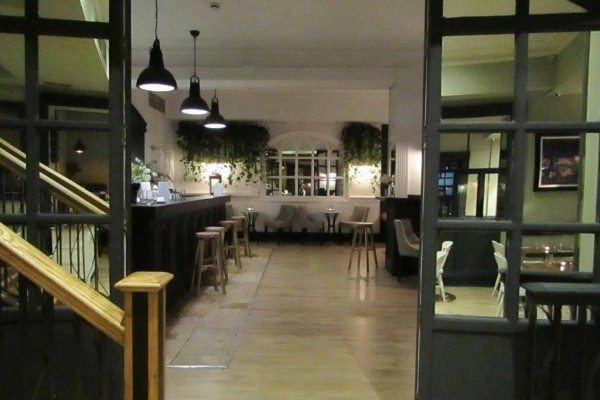 We ate in the brasserie bar where the trendy décor is dominated by the bold dark green/grey walls, with funky statement wallpaper and striking black accents. There are wooden floors throughout and plenty of glass and it feels spacious and airy. Tables are generously spaced and the chairs are a comfortable mix of white, wooden, cottage-style chairs, modern, pea-green, upholstered chairs and soft, padded banquettes with a good number of Burberry-esque scatter cushions to emphasise that informal lounge feel. There are lots of beautiful thriving plants and a few interesting knick knacks to boot, including a magnificent antique gramophone. 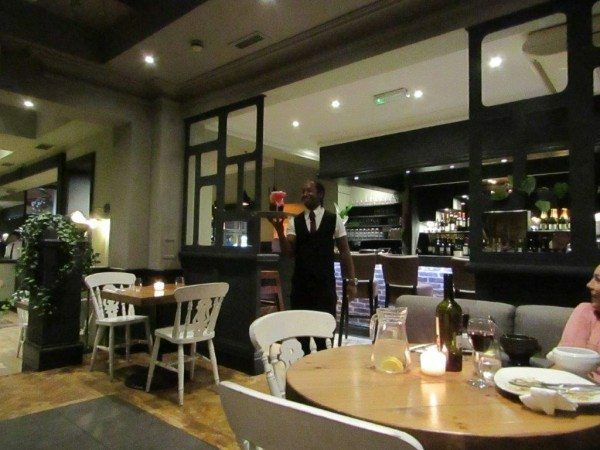 The soundtrack for the evening was provided by several notable R&B singers and one or two very bubbly and enthusiastic waiting staff. The food is described as contemporary European and the kitchen crew take their ingredients very seriously. Everything is locally-sourced, seasonal and organic wherever possible and their meat is ethically and sustainably reared, often at small family-run farms. While we looked over the menu we ordered a bottle of Fiano Di Puglia, a gorgeous, crisp, fruity, organic number, the colour of sunshine, which arrived perfectly chilled and was leisurely drunk from beautiful glasses. 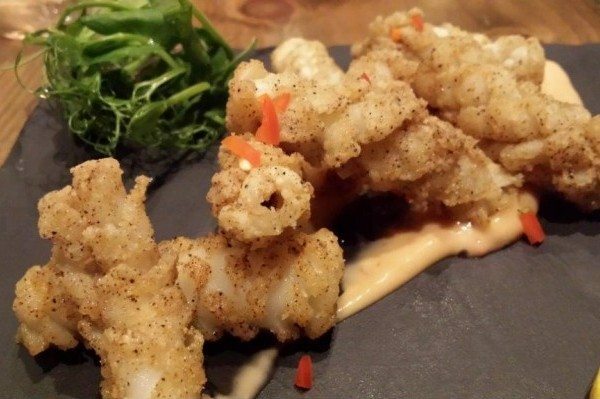 For his starter Andrew chose the fresh, chilli, salt and pepper finished squid, served with sweet chilli homemade mayo. The squid had a lovely crisp, salty coating that gave it a mouth-watering umami savouriness, which was perfectly offset by the creamy, sweet, tangy, chilli mayo and the sharpness of a squeeze of lemon. If I had a single minor criticism, it would be that the squid was perhaps a little firm but to be honest it was so delicious I could have eaten those little tubes of loveliness ‘til the cows came home. 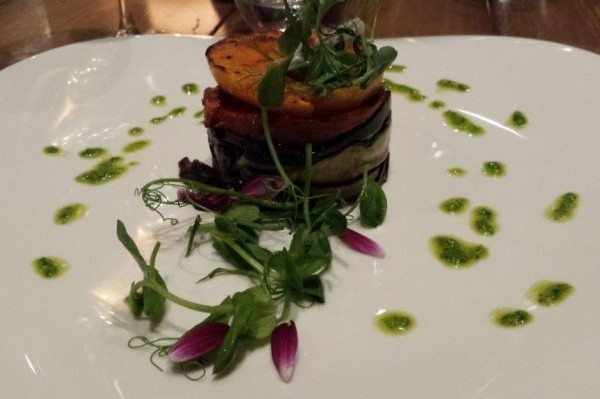 I opted for the chargrilled organic vegetable mille-feuille with black olive paste and basil oil. I was expecting a savoury version of a custard slice with layers of puff pastry filled with vegetables so I must confess I was initially a little disappointed when it arrive with nary a crumb of pastry in sight. However, my momentary disappointment was immediately replaced with unadulterated joy when I took my first mouthful. It was utterly divine, I may have actually melted in my chair slightly. Here, I thought to myself, is someone who really knows how to treat a vegetable! It was absolutely bursting with rich, complex, Mediterranean flavours. 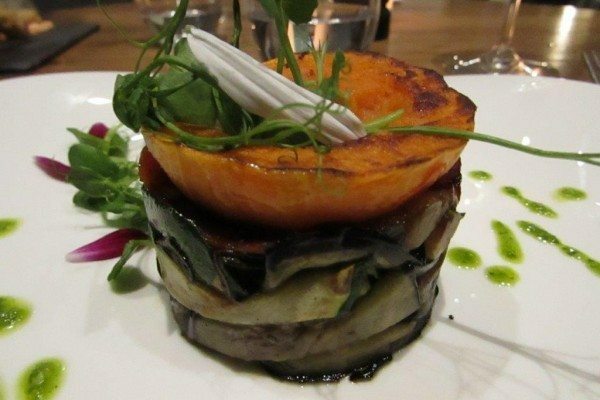 It was in fact a “thousand leaves” of exquisitely cooked and perfectly seasoned vegetables including red pepper, aubergine and courgette, topped off with butternut squash and drizzled with delicious, fresh, vivid green basil oil. It was luxurious, soul-warming and, as an added bonus, exceptionally healthy. Our starters were so good that we had high hopes for our mains and, I am happy to say, we were not disappointed. 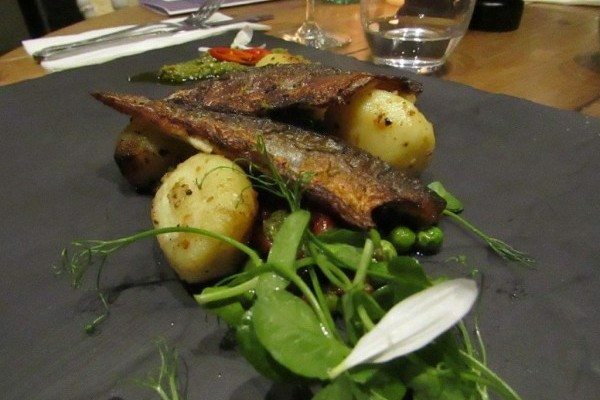 Andrew went for the fresh sea bass fillet, buttered new potatoes, petit pois fricassee, finished with a delicate olive oil, lemon, basil and cherry tomato sauce. It looked like a work of art on the slate, vibrant with colour and decorated with pretty little pea shoots and petals. The sea bass itself was perfectly cooked and again very well seasoned, with a fabulously crispy skin and delicate, moist flesh. It was served with gorgeous, buttery, golden new potatoes and beautifully fresh, sweet, plump peas. The sauce was like a thick, rich pesto and added a fantastic fresh basil and lemon kick. It all went extremely well together and was scrumptious! 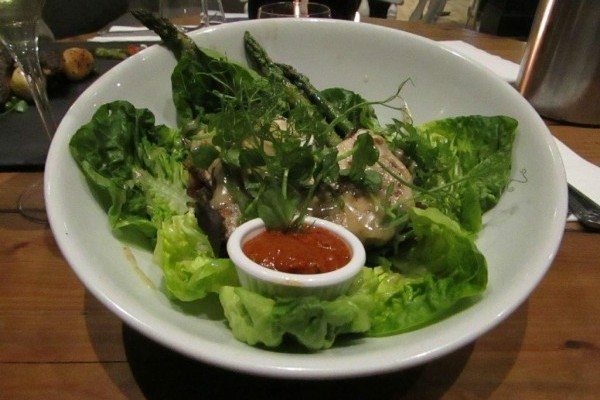 I had the free-range organic harissa chicken salad with baby gem lettuce and asparagus, parmesan shavings and a lightly spiced dressing. People so often underestimate the pleasure you can get from a simple, well-crafted salad, which is a real shame as they would most likely have overlooked this little gem (no pun intended). The fresh lettuce was crunchy and sweet, the asparagus was warm and respectfully cooked, the great hunks of chicken were moist and well-seasoned and it was all drizzled with a light, tangy, mustard dressing. The pièce de résistance however was the little pot of fabulously fiery harissa, which triumphantly united the dish into a lip-smackingly tasty union! Sadly we missed out on the delights of the pastry chef as, following a very successful opening night and a good day’s trade, they had nothing left to offer! So we were forced to console ourselves with a cocktail. It’s a hard life. Andrew went for a Long Island Iced Tea and I decided to try a Cosmopolitan. How I made it to forty two without trying a cosmo is anyone’s guess but it will certainly be my cocktail of choice from here on in. So in nutshell, we were really impressed and genuinely chuffed for all involved, long may it last!